Here are a few popular small climbs from around the Northeast. Some of these, such as Blue Hill, are near large metropolitan areas and are easily accessible to cyclists on after-work rides. Others, such as Pack Monadnock, are included in long weekend rides. And a couple others, such as Chestnut Hill, are included just because I like them. Undoubtedly, there are hundreds of 500+ foot climbs across the northeast. The criteria I use in adding climbs to this list are: a) it must gain at least 500 feet (a few exceptions permitted), b) it must be paved or at least generally rideable with skinny road tires, c) it should be popular with cyclists, and d) there should be some steep content, such as a stretch of 8% or higher grade and average at least 5% over the net gain. In other words, a good small climb is one that will make you suffer for several minutes. The data to create these profiles comes from a number of sources, including TopoUSA 7.0, USGS maps, park maps and brochures, GPS, aerial and satellite images. No two sources seem to agree. Ski areas are notorious for overstating vertical rise and summit elevations, in some cases by many hundreds of feet. If you check some of these numbers against your sources of info, you will likely see differences. To give one example, take Pack Mondadnock below. The state park map sites the summit elevation as 2290 feet, the base parking lot at 1450 feet, for a net gain of 840 feet. The pavement comes to within 10 feet of the highest point. However, TopoUSA shows the summit to be 2274, base to be 1486, for a net gain of only 788 feet. A big difference when it’s only 1.3 miles terrain distance. 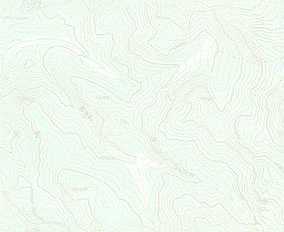 I downloaded the aerial imagery for Pack Monadnock and compared DeLorme’s map against it. There are some significant deviations in the area of the upper switchback. That’s why dips appear in the profile below, but in reality, the road remains steep in those areas. * Not all climbs reach the highest point of the mountain. This little beast is easily accessible from the two largest metro areas in NH, Nashua and Manchester. Also shown in the large hillclimbs plot, only the toll road portion of the climb is shown here. Some cyclists will not want to climb busy Rt 101, so there is ample parking at the base of the summit toll road in Miller State Park to unload a bike. Do expect to pay a few bucks to head up during the summer months. The road is very steep and is excellent practice for the bigger, longer hillclimb races. Some cyclists will not be able to push standard two-ring gearing on the 20% grade at the top. A wide range cassette or triple crank may be necessary. Very nice views of Mt Monadnock to the west, the Wapack range to the south, and the flat lands to the east. 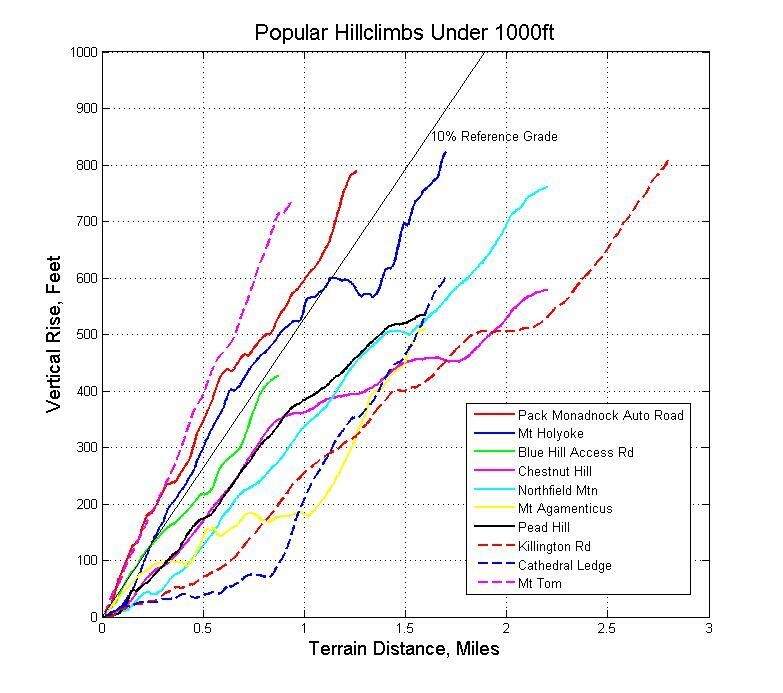 Note that this is a true monotonically rising climb, which is inaccurately depicted by the Topo plot. A great climb for training repeats. This steepie is near Springfield, MA in Skinner State Park. The road has a decent surface, and the switchbacks near the top are a lot of fun. Both paper and electronic maps do not accurately depict the average grade of Mt. Holyoke. Other than a sustained 12%-ish section near the bottom, the swoopy switchbacks at the top really take punch out of this climb, and DeLorme’s Topo mapping software is horribly inaccurate in this area. It depicts grades greater than 50%, so I used other map sources and direct observation to best-guess correct this error. Anyway, this is a great mountain to practice climbing and testing fitness on. During the off-season, the gate part way up is closed, which is a bit of a pain. Spectacular views from the top. The profiled portion of this climb begins near Dean Hill Rd just off Rt 4 on the access road and ends at Killington Base Lodge. Not much to see here in the summertime except for the downhillers in body armor getting back on the gondola. Still a nice out-and-back if you are doing a loop on Rt 4 past Killington. I believe this was included in the popular Killington Stage Race several years ago. Just off of Rt 2 at Exit 12. Never biked up this road, but I have skate skied it and thought it would also be quite challenging to climb with a bike. There was thin cover that day, so as best I could tell, it was paved all the way up. A bit of a view over the reservoir up top. This park is open to mountain biking in the summer months. Just outside of the village of N. Conway, this short climb packs an initial steep punch once you hit the steep part. Most of the vertical is gained at 10-12% grade. The road is closed late in the fall, but still open to bikes and hiking. During peak tourist periods, expect a lot of cars and walkers. View from the ledge is spectacular, pretty near a 500 foot perfectly vertical cliff. Just south of Boston, this little gem also packs some >10% sections. I’ve taken my mountain bike up this one a while back when I explored the Blue Hills off-road style. Some nice views too. Many locals use this for training repeats, fitness testing, or time themselves just for bragging rights. Profile has been updated June-08 to reflect portion riders use. Just west of the Nashua and Manchester area, this back-roads climb is one of my regular training climbs. I’ve climbed it many, many times on lunch rides from work. The steep mile near the bottom is nearly 10% grade, and you can expect to exceed 50mph coming back down this clean, gently curving road. There’s a group of us that track our performance by time-trialing up Chestnut. Start from the stop sign at Horace Greeley Rd, stopping at the New Boston town line sign at the top. My PR is 8 minutes, 14 seconds. If you want to do a nice loop with another good climb, continue on Chestnut past the tracking station, bearing left near the bottom, and continuing on to Uncanoonuc. This climb starts nearly from downtown Wilton on Dale St, then bearing right when you reach Pead Hill Rd part way up. Pead packs a deceptively steep punch for a small hill. Very nice views of the Wapack Range (North and South Pack Monadnock plus others) to the west. Pead hill is often included in our weekend group training rides. Coming back down Lyndeborough Center Rd is both scenic and very fast. The profiled portion of this climb begins at the low point of unpaved Mountain Rd heading east. The first mile climbs at a moderate pitch on a pretty choppy dirt surface. About when the pavement is reached, a left is taken on paved Mt Agamenticus Rd to the summit. This portion is quite steep, with a section or two reaching over 12% pitch. This climb is part of a 7.4 mile time-trial that starts in S. Berwick and ends at Mt “A” summit. The race organizers recommend not using your good wheels on this course. Mt “A” is a popular mountain biking destination also. It used to be a small ski area many years ago. View of the ocean from summit. This climb starts from the abandoned Mt Tom ski base area and climbs the old cog railway line. It is straight as an arrow which makes this already steep climb all the more demoralizing. Bring your low gears. The pavement is not in the best shape anymore, so great care must be taken on the descent. There are a few waterbar/frost heaves, and the surface may be wet and slimy in the spring. The view from the summit is one of the best in south-central Mass.